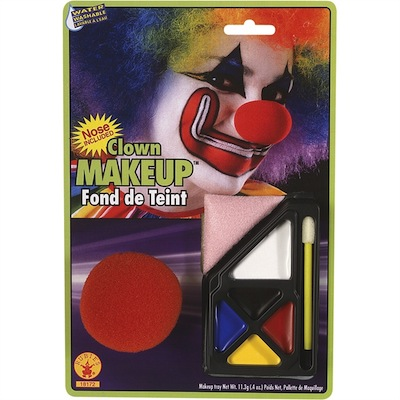 The Clown Costume Makeup Kit includes a 5-color water washable makeup palette, clown nose character accessory, make-up sponge brush applicator, makeup sponge, and step by step insructions on back of card. A clown face pattern through make-up face paint is a great finish to your clown costume. This costume make-up face paint kit will give you the ability to create happy, sad, funny or scary clown faces.